While Kirk Kerkorian is probably best known for opening one of the most luxurious resorts on the Strip, the MGM Grand, he has also had his hand in a variety of other business ventures over the years. This self-made billionaire, who doesn't have a formal education beyond the 8th grade, overcame tremendous odds to build his fortune. 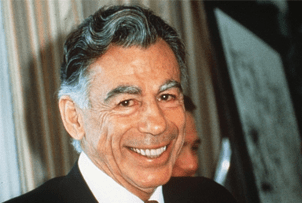 Continue reading this detailed biography to learn more about Kirk Kerkorian, including everything from his childhood to his early love of aviation to his impact on Las Vegas. While Kerkorian may no longer be with us, we will never forget what he has done for the gambling industry, and we will forever be thankful for the legacy he left behind. Kerkorian was born on June 6, 1917, to Ahron and Lily Kerkorian. His parents had recently immigrated to the United States from their home country of Armenia with their 3 children. They moved to the US to escape the Armenia Genocide, as millions of Armenians were being killed by the Ottoman government. Although they felt safer in the United States and had no intentions of returning to Armenia, they still didn't want their children to be completely separated from the Armenian culture. For this reason, Kerkorian's parents only spoke Armenian in their home. Armenian became Kerkorian's first language, as he didn't learn English until he started school. Kerkorian loved going to school. He picked up English quickly and was advanced when it came to mathematics and science. Unfortunately, the Depression left his family in a financial state of emergency. Kerkorian was forced to drop out of school after the 8th grade to help financially support his family. He sold produce with his father during the days and practiced his boxing at night. He was an excellent boxer who performed well in all the competitions he participated in. People started calling him "Rifle Right Kerkorian" the moment he won the Pacific Amateur Welterweight Championship. His love of boxing was soon replaced with a love for aviation. After one of his co-workers took him for a ride on his single-engine airplane, he had a desire to learn how to fly. He made a deal with Florence "Pancho" Barnes, agreeing to tend to her cows in exchange for flying lessons. Impressed by his determination, she agreed to take him on as her first student. His aviation skills earned him a spot in the Royal Canadian Airforce during World War II. He was responsible for delivering airplanes to Scotland. Every trip he took earned him $1,000. He found this to be a wonderful opportunity to save up money, and by the time the war had ended, he had earned enough cash to purchase his own airplane. Now that he had the proper transportation, he started making frequent trips to Las Vegas. His favorite game to play at the casinos was craps, with roulette and blackjack coming in as close seconds. Kerkorian quickly became known as a loose player, often winning and losing tens of thousands of dollars at one time. To make more money to fund his gambling adventures, Kerkorian purchased a small charter airline for $60,000 in 1947. He named it the Trans International Airline and started offering flights to and from Las Vegas. He eventually offered more flights within the US and ultimately moved on to international flights. Using his profits from the Trans International Airline, Kerkorian purchased 80 acres of land near the booming Las Vegas Strip. Caesars Palace ended up renting the land from Kerkorian for several years before they bought it from him in 1968. Kerkorian made $9 million off that deal. He then went on to purchase another 82 acres of land on Paradise Road in Las Vegas. This time, he built one of Las Vegas' first family-friendly hotel and casinos: the International Hotel. They offered activities for kids and provided discounts to family-fun attractions in the area. Many famous performers made an appearance at the International Hotel, including Elvis Presley and Barbra Streisand. Kerkorian also bought the Flamingo Hotel, which he would later sell alongside the International Hotel as a package deal to the Hilton Hotels Corporation. He used the profits from that deal to purchase the Metro-Goldwyn-Mayer studios, which he turned into the MGM Grand Hotel and Casino. At the time, the MGM Grand was the largest hotel on the Strip, and it attracted thousands of people from all over the world. A devastating fire at the MGM Grand would lead to the death of 87 people and cause the hotel to be closed for several months. Soon after it reopened, Kerkorian sold it to Bally Manufacturing for just under $600 million. While Bally Manufacturing now owned the hotel, they did not own the rights to the MGM name. Kerkorian would eventually build a new MGM Grand Hotel and Casino in 1990. This resort was bigger and better than the original, and it set the bar high for other casinos on the Strip. Kerkorian went on to own and operate a number of other high-end resorts in Las Vegas at one time or another, including the Mirage, the Bellagio, Monte Carlo, Treasure Island, and several others. Kerkorian teamed up with Lee Iacocca, the former chairman of Chrysler Corporation, in an attempt to take over the company. He bought as many Chrysler shares as he could and applied several business tactics to increase the value of the company's stock. The members of the board quickly stepped in and stopped their hostile takeover dead in its tracks. Kerkorian was still able to walk away from this ordeal a few billion dollars richer. Moving on from Chrysler, Kerkorian purchased nearly a 10% stake in General Motors. He then hired someone to represent him on the company's board. He warned General Motors of a potential merger between Nissan and Renault and suggested they appoint Nissan's Carlos Ghosn as the chairman of their board. His request was denied, so Kerkorian quickly sold most of his GM stock. Finally, in 2008, he started buying stock in the Ford Motor company. After investing about $1 billion, he owned roughly 6% of the company's shares. Unfortunately for Kerkorian, Ford Motor ran into some financial difficulties, and his investment soon lost two-thirds of its value. That's when he decided to start selling his Ford Motor stocks and get out of the auto industry for good. In 1988, the Spitak earthquake struck Armenia, killing thousands of people and destroying the infrastructures of numerous buildings across the country. Armenia was left in ruins, and Kerkorian felt horrible. He knew he had to help, so he founded the Lincy Foundation. It provided houses and apartment buildings to the countless citizens of Armenia who were left homeless after the earthquake. It also paid to rebuild many of the bridges and roads that had been destroyed. After Armenia had recovered from the earthquake, Kerkorian decided to use the foundation to improve other areas of Armenian life. Money was donated to hospitals, schools, and recreation facilities in almost every major city in Armenia. Kerkorian poured more than $1 billion into Armenia over the years. To show his appreciation, the president of Armenia presented him with the "Medal of Fatherland," naming him as one of their country's heroes. In 2011, the Lincy Foundation transferred all of its assets, a total of $200 million, to form the Dream Fund at UCLA. This fund is used to conduct medical research, enhance UCLA's academic programs, and give students the chance to participate in other charitable projects around the world. Kirk Kerkorian has been married a total of 3 times. His first wife was Hilda Schmidt, and their marriage lasted nearly a decade. She broke off the marriage because she feared he was becoming addicted to gambling. Since she had been raised by a father who also had a gambling problem, she chose to leave Kerkorian before his gambling habits got worse. Two years after the divorce, Kerkorian was ready to wed again. This time, he married Jean Maree Hardy, who would be his sweetheart for almost 30 years. They had two daughters together: Tracy and Linda. Although it has never been proven, rumor has it that their marriage ended because Kerkorian cheated on his wife while away on business. Kerkorian's third marriage was by far his shortest. He married Lisa Bonder, who was a professional tennis player at the time. There was a 48-year difference between the couple, which was a huge factor as to why their marriage only lasted 28 days. Bonder tried claiming that Kerkorian was the father of her unborn daughter, but a DNA paternity test would prove otherwise. In 2013, Lisa frantically called the police, saying that Kerkorian was being held hostage by his legal advisors at the Tracinda Corporation. She claimed he had been missing for over 5 months and she was worried that he might be dead. After a thorough investigation, the police realized it was all just a big scam for her to get more money from the divorce settlement. The Tracinda Corporation was forced to release a statement saying her allegations were false and that Kerkorian was perfectly fine. Kerkorian's physical fitness was always very important to him. Even in his 80s, he went for runs and played tennis with his friends. When he wasn't doing that, you would probably find him spending time with his two daughters or any of his four grandchildren. He always made spending time with family one of his top priorities. Making it to the ripe age of 98, Kirk Kerkorian passed away on June 15th, 2015. Thousands of people gathered together to show their respects to Kerkorian and his family. Many people even traveled from Armenia to show their appreciation for all the improvements he has made over there.